d. stands for denarius or denarii (a Roman coin). LSD was the abbreviation for £:s:d, pounds, shillings and pence; otherwise known as 'old money': the pre-decimal coinage of the UK until 1971. 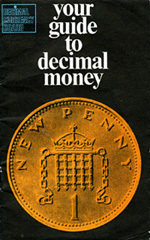 Leaflet: Your guide to decimal money. Barclays, Lloyds, Midland and the newly merged (in 1970) National Westminster (Nat West). Another long established bank which was commonplace in the high street... In 1861 the Palmerston Government set up the "Post Office Savings Bank" - a simple savings scheme aiming to encourage ordinary wage earners "to provide for themselves against adversity and ill health". 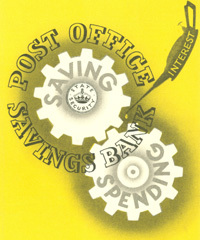 Leaflet: Post Office Savings Bank - Saving and Spending. The Financial Services Authority (FSA) was an independent non-governmental body, given statutory powers by the Financial Services and Markets Act 2000. The FSA used a wide range of rule-making, investigatory and enforcement powers to fulfil its statutory objectives. From 1st April 2013, the Financial Services Authority (FSA) was replaced by the Prudential Regulation Authority (PRA) and the Financial Conduct Authority (FCA). 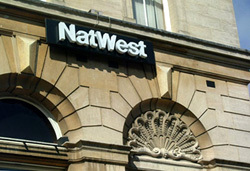 The deposit compensation limit rose from £50,000 to £85,000 for each person, per authorised firm, from 31 December 2010. This offers consumers greater protection and brings the savings guarantee in the UK into line with much of Europe. History: From 1 January 2016 the deposit limit for bank accounts was reduced to Â£75,000. This was the sterling equivalent of â‚¬100,000 as required by the recast Deposit Guarantee Schemes Directive. From 30 January 2017, the limit increased back to Â£85.000. The Financial Services Compensation Scheme (FSCS) is the UK's statutory fund of last resort for customers of authorised financial services firms. 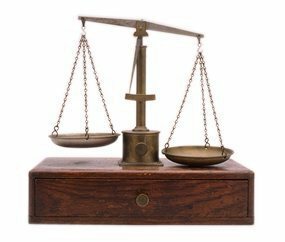 FSCS can pay compensation if a firm is unable, or likely to be unable, to pay claims against it. FSCS is an independent body, set up under the Financial Services and Markets Act 2000 (FSMA). Value Added Tax was introduced into the UK on 1st April 1973 as a requirement for joining the European Economic Community (EEC) or 'Common Market'. It replaced 'Purchase Tax' which had been a levy on 'luxury goods' since October 1940. Design, images and text compiled by © Light-Straw. Page last updated 17 Feb 2018.